My hubby and I always roast a chicken on a Sunday night so that we know during the week we will always have something healthy to hand for lunches or quick evening meals. Easily bored of eating the same thing, I’m always trying to come up with new ways to use this chicken in salads and soups, keeping the smart points low but the flavour level high. This recipe is one I first started making last summer and it’s been a firm favourite ever since. 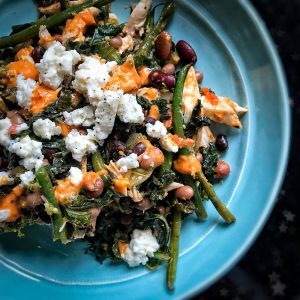 I love the easy harissa feta dressing as it really lifts the salad ingredients and the ingredients in it are usually bits I always have lurking around the cupboards/fridge. If you don’t have a blender for the dressing, simply mash the feta into a paste before mixing through the other dressing ingredients. If you prefer your beans cold, these can be drained and added straight to the cooked kale and green beans. Pop the kale and green beans into a pan of salted boiling water and simmer for 4-5 minutes until the kale is wilted and green beans have softened a little. Drain and add the green beans and kale to a large mixing bowl. While the kale and green beans are boiling, pour the mixed beans into a saucepan and heat gently for 4-5 minutes, stirring occasionally. Don’t allow the beans to boil. Drain once warmed through and add the beans to the mixing bowl. Add the shredded chicken to the bowl, season with salt and pepper and squeeze over the juice of ½ lemon. In a blender, blitz the harissa pasta, 40g of the feta cheese, yogurt and red wine vinegar. Season with salt and pepper (you could also just mash up the feta and mix through the other ingredients). Toss half of the dressing through the contents of the mixing bowl. Split the contents of the mixing bowl between two serving bowls. Finish with a final crumble of feta, drizzle of dressing and sprinkle of crushed chillies (if you like a little heat) on both.